When we no longer have to drive our own cars, we’ll all become passengers with very different expectations of what we want from our vehicles. 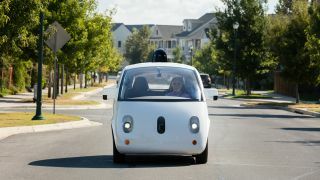 The companies invested in selling autonomous experiences to consumers will have to re-focus on the passive passenger rather than the active driver. Uber is a company that’s already making a start on this. If a recent patent is anything to go by, one of the first things Uber is trying to improve on is instances of motion sickness. Often motion sickness is caused when there’s a disconnect between what we see and what we feel. It’s common on fast-moving rollercoasters, in VR games and when reading in vehicles. As time-rich passengers we’ll likely find ourselves occupied with other activities in our cars which, combined with the potentially more jerky movements of AI drivers, could result in increased instances of in-car sickness. Called the Sensory Simulation System, Uber’s proposed solution will try to trick the body by creating movements in-car that more closely resemble what your eyes see by using a combination of movement, air and light. Using data from a set of self-driving “eyes”, the car would move motorized seats, target pressurized air flow or adjust the in-car lighting to mimic what’s happening outside the car, theoretically keeping motion sickness at bay. Looking into systems such as this makes a lot of sense for Uber, considering the company has made it clear it’s fully invested in self-driving cars by purchasing a fleet of 24,000 self-driving vehicles from Volvo. Of course, given that this is a patent it’s far from certain whether we’ll ever see the Sensory Simulation System appear in any of Uber’s cars. What’s clear, however, is that car manufacturers are going to have to start thinking differently about in-car technologies and experiences when drivers are no longer needed.